You may also want to check out these other Bill Cosby series: "I Spy (1965)", "Cosby Mysteries (1994)", and "Cosby" (1996). The Cosby Show was a 30 minute family/comedy series on NBC about the day-to-day lives of an upper middle class African-American family. Dr. Huxtable and his wife were very happily married and did their very best to raise their four kids to be responsible adults. ABC had a chance to own The Cosby Show but they rejected it. NBC was smarter and landed the hit comedy series that raked in the money for eight full seasons! Then when NBC put The Cosby Show in the same time slot that CBS was airing the hit series, "Magnum P.I. ", nearly everyone in the business agreed that The Cosby Show would be lucky to survive a full season. Wrong again! During the summer hiatus in 1988, Lisa Bonet and her husband Lenny Kravitz announced that they were pregnant. The producers of The Cosby Show were concerned that viewers might not accept Denise as a single mother after four years of her "nice girl" image so they had her drop out of college and spend the fifth season in Africa. Bill Cosby didn't care much for working in Hollywood so he demanded that The Cosby Show be produced in New York. Even though the Huxtables lived in Brooklyn, the exterior shots of their home on The Cosby Show is actually a house located at 10 Saint Luke's Place in Manhattan. 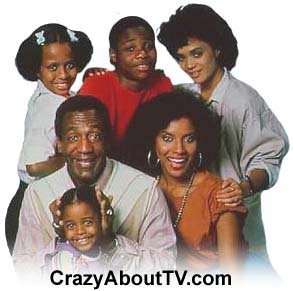 The Cosby Show was based on Bill Cosby's family in real-life. He also has a wife (who he's still with after 44 years as of 2008) and four daughters and one son who is the middle-aged child! Sitcoms were beginning to fade in the ratings in the mid 1980s. TV Guide stated that The Cosby Show was TV's "biggest hit in the 1980s and almost single-handedly revived the sitcom genre and NBC's ratings fortunes". "All in the Family" and "The Cosby Show" are the only two U.S. programs that managed to remain at the number one position in the ratings for five seasons in a row! Thank you for visiting our The Cosby Show page!